After so many Man Dates at Red Robin I’ve gotten onto the press release list to learn about all the newest offerings. While I’m no fan of the Oktoberfest Bürger, the only extra meat I want on a burger is bacon or another burger, I am a fan of bratwurst and I really want to try the new Brew-Battered Brats and probably pair that with a Spiced Pumpkin Pie Shake. GREENWOOD VILLAGE, Colo., Sept. 3, 2013 – This season, Red Robin fans will raise their steins in approval with the return of a fall favorite — the Oktoberfest Bürger! 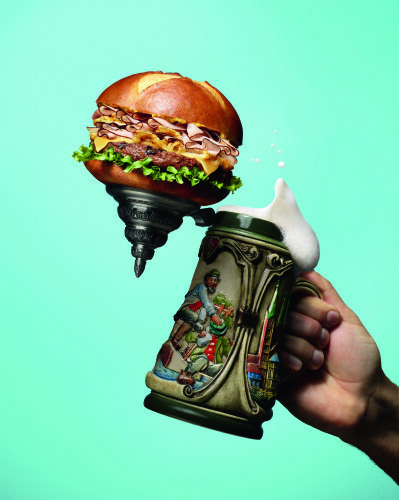 Now through Nov. 10, guests can enjoy the craveable Oktoberfest Bürger, a fire-grilled burger topped with Black Forest ham, Swiss cheese, tangy beer-mustard sautéed onions and crisp lettuce on a perfectly toasted pretzel bun. Red Robin’s take on classic Oktoberfest flavors will make guests want to put on their Lederhosen in celebration. 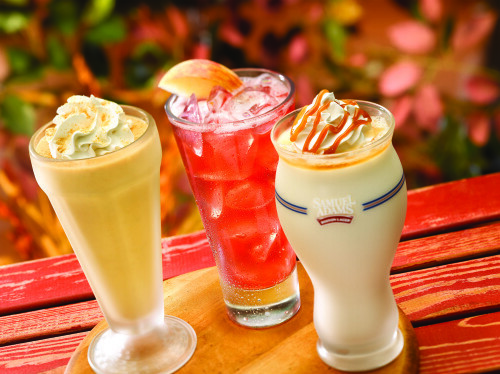 Red Robin is also remixing a classic American dessert in a new milkshake that captures the flavors of fall and brings the warmth and comfort of pumpkin pie to every table — with a Red Robin twist. The Spiced Pumpkin Pie Shake, made with real Libby’s® pumpkin pie filling, vanilla soft serve, nutmeg and graham cracker crumbs, pairs perfectly with Red Robin’s Oktoberfest-inspired menu. Also back by über-popular demand, Red Robin’s O’Fest Beer Shake will once again be on tap after making its debut last fall. This unique, 21-and-over milkshake is made with creamy vanilla soft serve blended with caramel and Sam Adams® OctoberFest draft. With the new Brew-Battered Brats, the Gourmet Burger Authority has also crafted the perfect appetizer to pair with any meal. Deliciously juicy with a hint of heat, these five beefy jalapeño-cheddar brats — beer battered and fried to the perfect crunch — are served on a bed of freshly made Yukon kettle chips. · Captain’s Berry Angry Cocktail – This twist on hard apple cider is a delicious mix of Captain Morgan® Spiced Rum, Angry Orchard® Crisp Apple Cider, a touch of raspberry and a sprinkle of nutmeg. · German Chocolate Brownie Bite-Tini – This new dessert is a decadent combination of rich, chocolate brownie bites and light, fluffy whipped cream, topped with a garnish of toasted coconut. Now that’s YUMMM-y! Reminiscent of the seasonal flavors of Oktoberfest, Warm Pretzel Bites —soft pretzel bites served with Merkts® beer cheese — are available throughout the season to round out Red Robin’s Oktoberfest celebration. 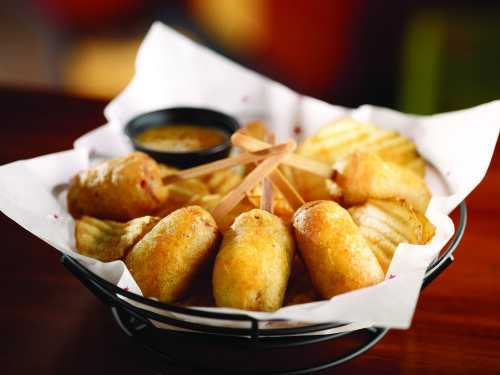 For more information on the fall menu or to find the restaurant location nearest you, visit www.redrobin.com. Red Robin Gourmet Burgers, Inc. (www.redrobin.com), a casual dining restaurant chain founded in 1969 that operates through its wholly-owned subsidiary, Red Robin International, Inc., is the gourmet burger expert, famous for serving more than two dozen craveable, high-quality burgers with Bottomless Steak Fries™ in a fun environment. Red Robin’s award-winning burgers have earned the title of Best Burger in the full service category in the Zagat Fast Food Survey four years in a row. In addition to its many burger offerings, Red Robin serves a wide variety of salads, soups, appetizers, entrees, desserts and signature Mad Mixology® Beverages. There currently are 481 Red Robin locations across the United States and Canada, including 342 company-owned Red Robin® restaurants and five Red Robin’s Burger Works® locations, and 134 Red Robin® restaurants operating under franchise agreements. Red Robin… YUMMM®! Connect with Red Robin on Facebook and Twitter.